It’s been a long time coming, but at last our new web site is up and running! Music Samples: This page contains an extensive list of sheet music and mp3 samples of the products found in our store. Music Shop: Our new online store! Here you can browse all of our products and make your purchases via our secure shop – all without leaving home. Some products are even available as a download, which means no waiting as the download link is sent immediately to your inbox! Our News: The place where you will find details of all the latest goings-on. 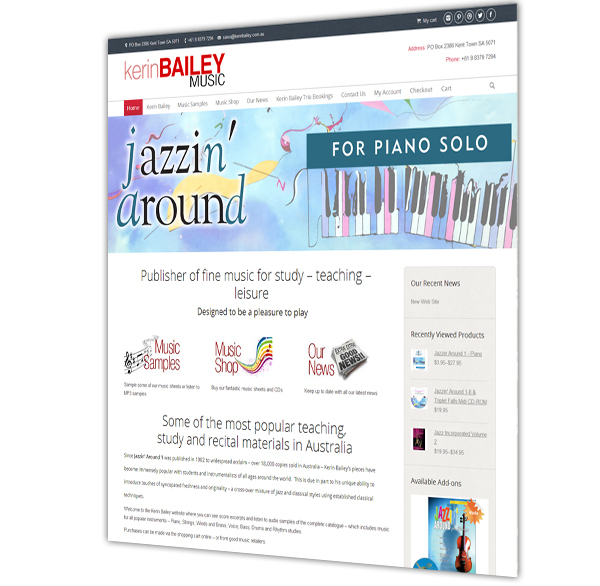 Kerin Bailey Trio Bookings: If you are interested in booking the Kerin Bailey Trio, or Kerin as a solo performer, you can make an enquiry via this page. Contact Us: All the details to get in touch, including an online form to email us instantly. We hope you enjoy your time browsing our site, please feel free to provide us with feedback via our Contact Us page, or by emailing us at sales@kerinbailey.com.au.